Nevelske and Krasnohorivka came under fire. 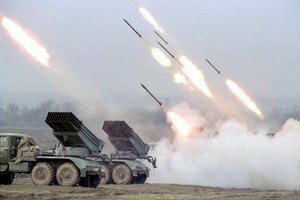 This morning, pro-Russian militants used the BM-21 Grad multiple rocket launcher (MRL) against the ATO forces in Donbas, thus severely violating the Minsk agreements, the antiterrorist operation (ATO) press centre has said on Facebook. The shelling was carried out from occupied Donetsk against Nevelske and from Staromykhaylivka against Krasnohorivka. "At least 10 projectiles were fired at ATO strongpoints on each particular occasion. The attack started at 0515 am," it said. Over the last 24 hours, the ATO positions in Donbas have been fired at 62 times.